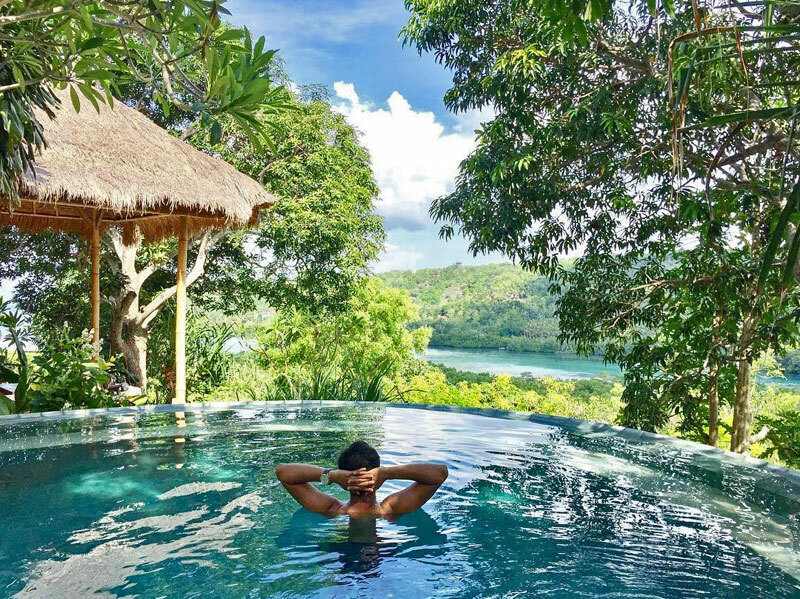 Want to get a little dose of tranquility after rubbing shoulders with other Bali-ophiles? 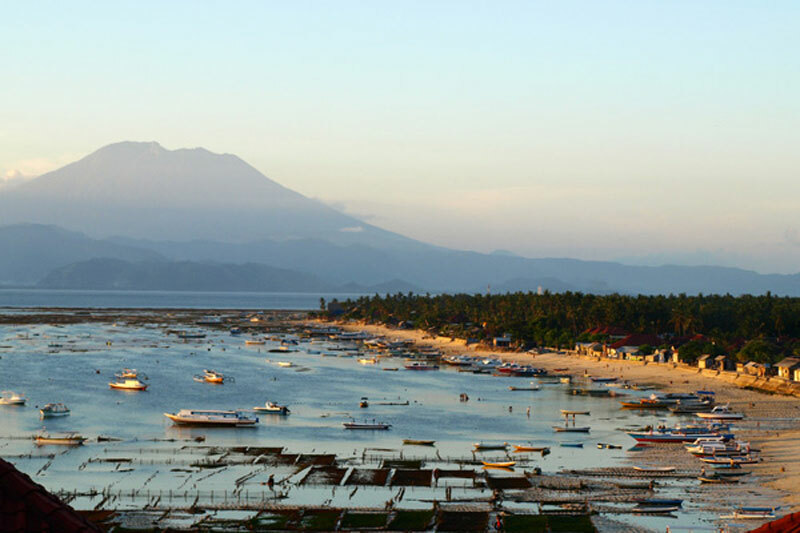 Heavenly as it is, Bali can be quite jampacked and fast-paced with tourist traffic. 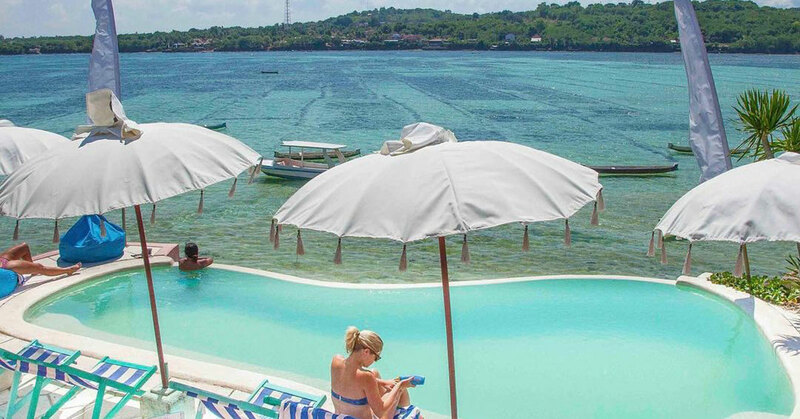 The solution to that lies just 30 minutes away from Bali’s mainland. 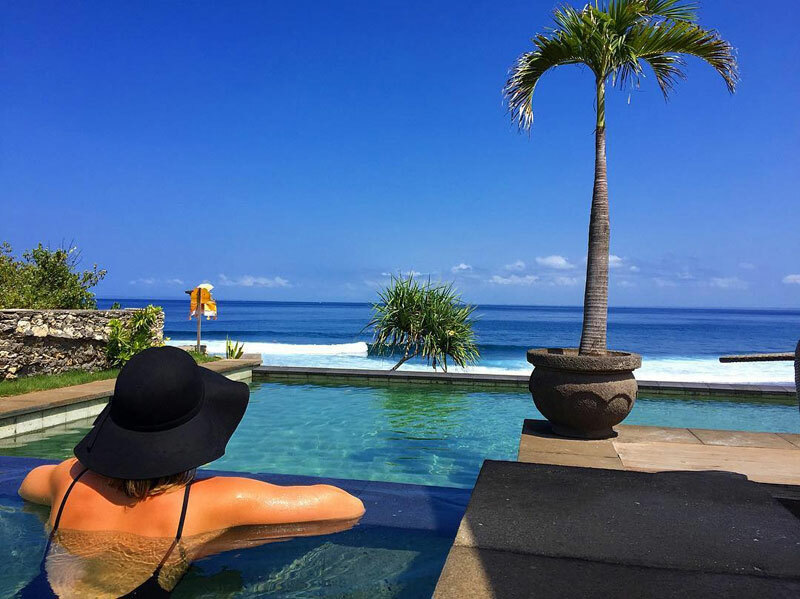 Pack your beach necessities and head out to the South Eastern coast of Bali – to the Nusa Islands. 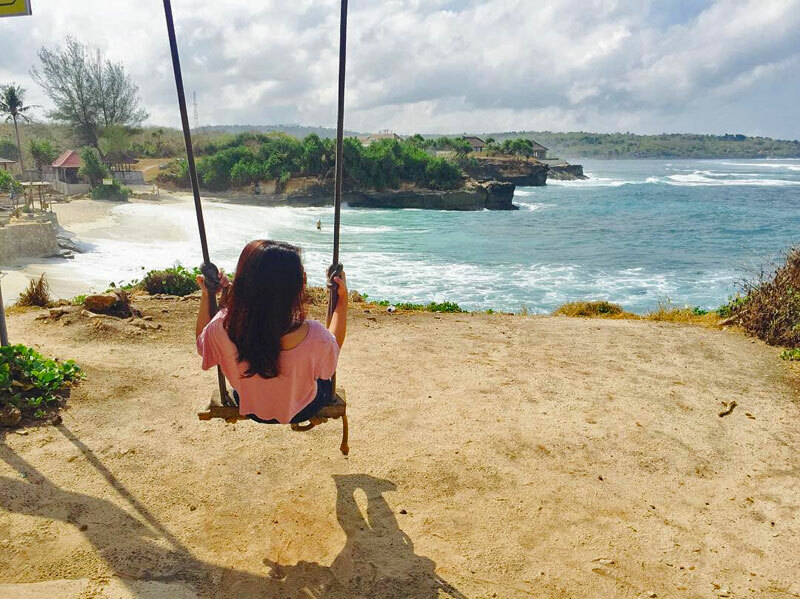 Nusa Penida, Lembongan and Ceningan are the trio of Nusa Islands that continue to charm travellers with its crystal clear water, secret beaches, premier surf waves, and the perfect laidback ambiance. 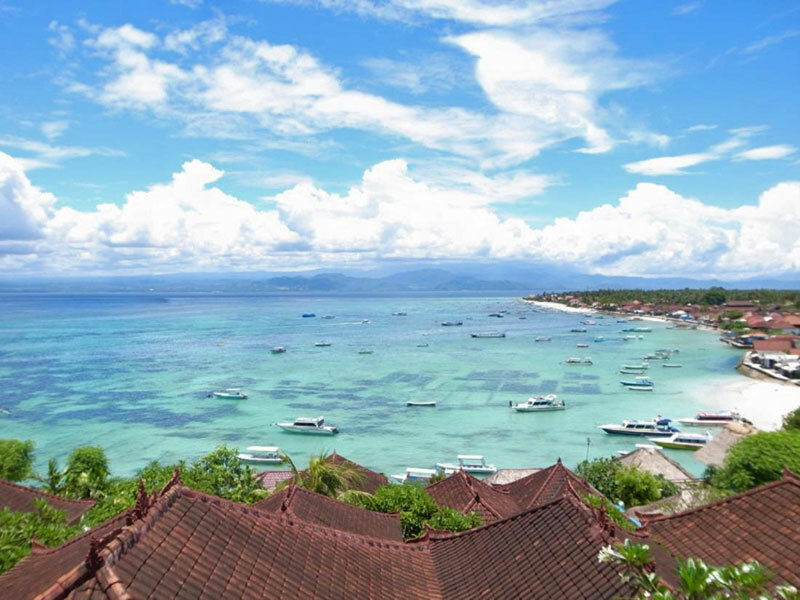 An established part of the Bali surf circuit, Nusa islands are also the most ideal choice for couples who are looking to do water sports, beach activities or simply relax under the sun. Team up with the fact that there are many affordable oceanfront accommodations ( just under $55! 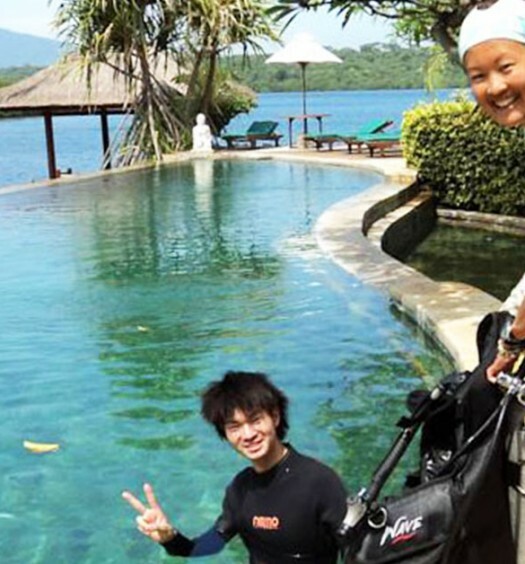 ), you’ll be getting a bang for the buck and an unforgettable holiday for two. Note: The prices reflected below are the low season rates for oceanfront villas, and they exclude tax and service charges. Accommodation rates often change with room availability, and low or high seasons. We recommend double checking for the final prices before confirming your booking. 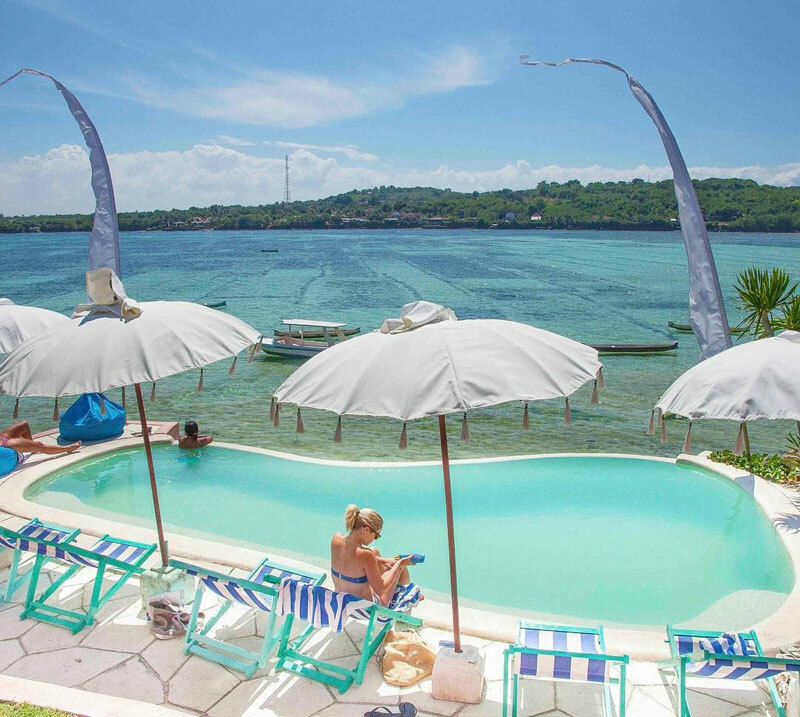 Set on a prime position on a low cliff with direct beach access, Le Pirate Beach Club enables you to wake up to the beautiful panorama of turquoise waters surrounding Nusa Ceningan. 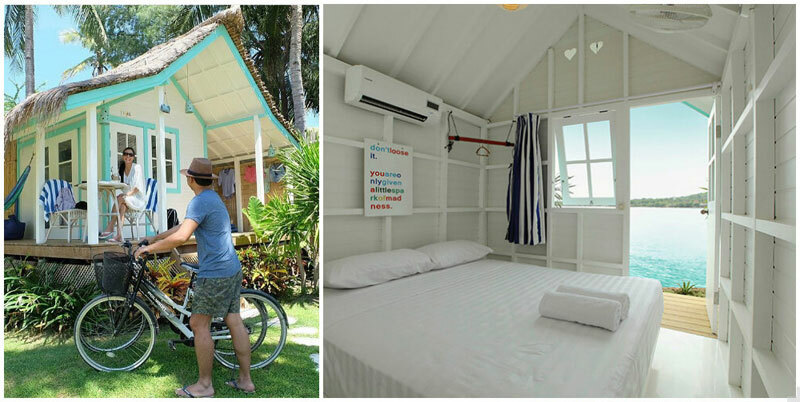 There are 2 types of room you can choose from, the beach box for the couple or the bunk bed that can accommodate up to 4 pax. 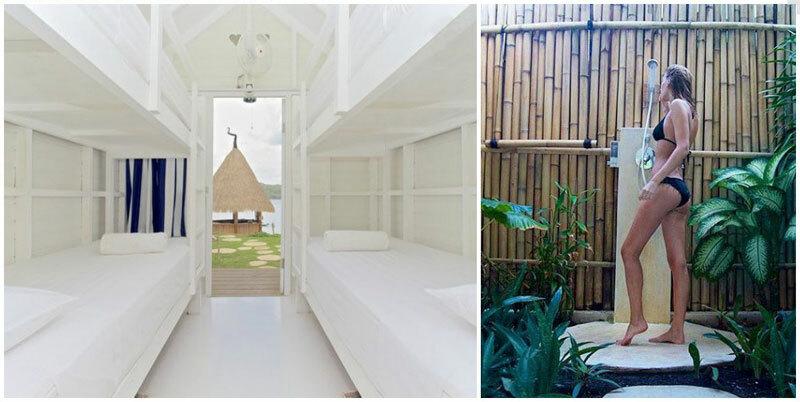 All the rooms are made to resemble small huts with open-roof bathroom concept. Styled for the island life, this makes for the perfect getaway when you just want to relax all day while taking in the picturesque ocean view. 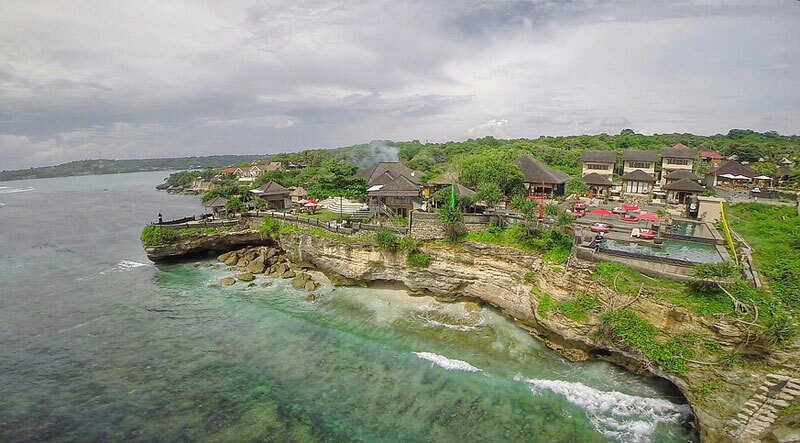 Located on the cliffs above the Selambung beach (or otherwise known as the Coconut beach), this soul-relishing hotel greets guests with the best natural ambience of the island. 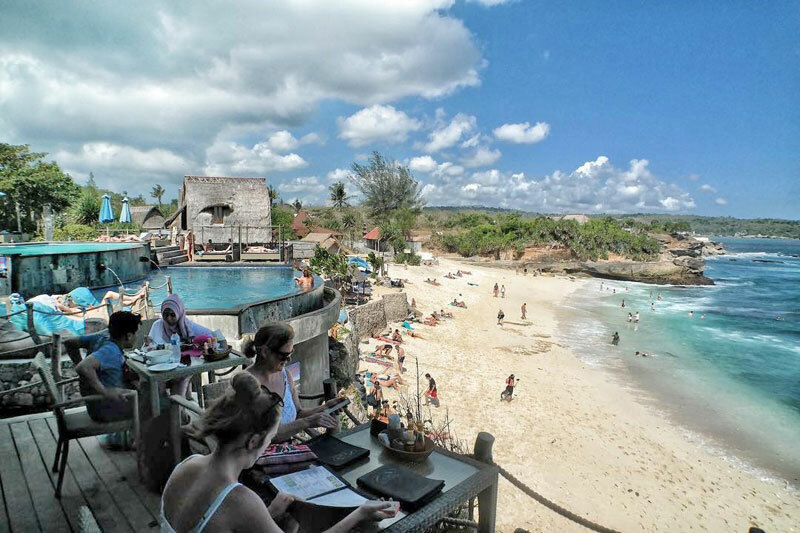 This place also offers the best seat with a view of the main beach of Nusa Lembongan. 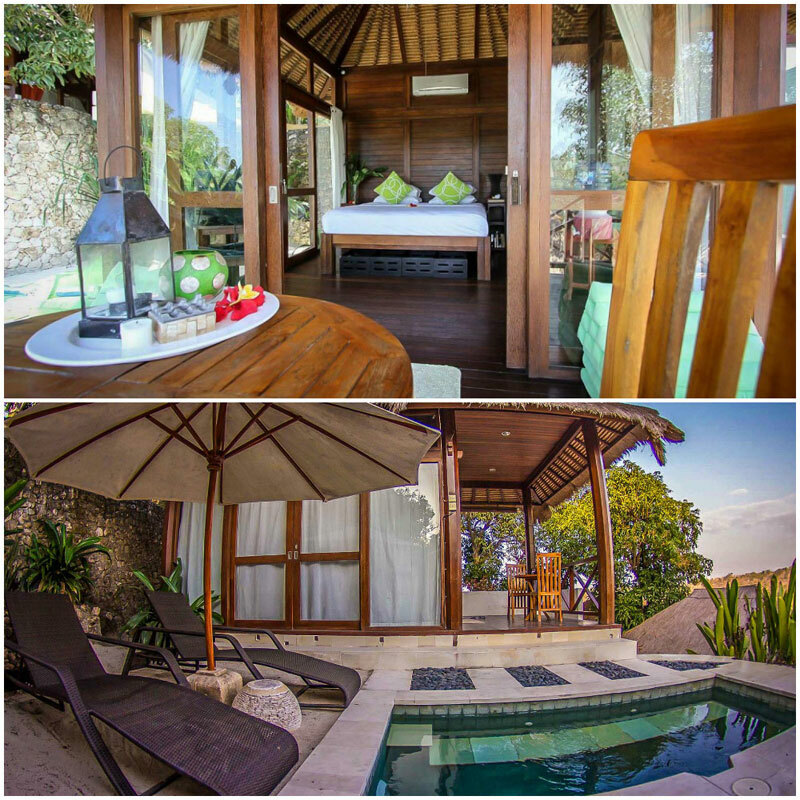 The beautifully presented rooms are all decked in traditional Balinese interior. 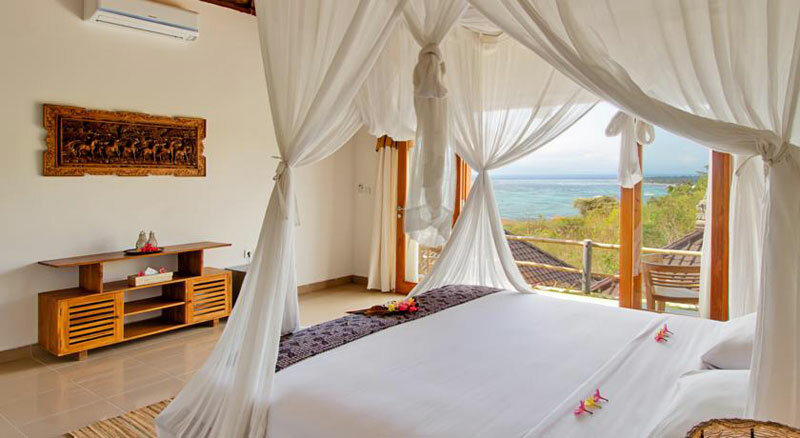 While all villa types are to-die-for, the cliff suites will be the best choice as it provides private access to the beach. 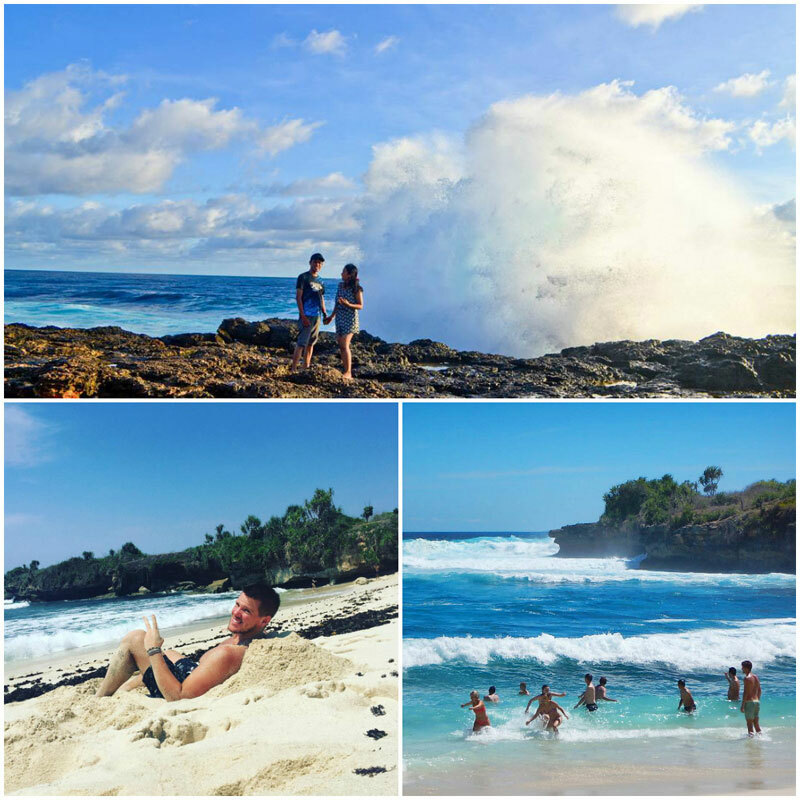 With the snorkeling spot just 5 minutes away and 3 of the best surfing points right in front of you, we bet you can’t wait to frolic on the beach with your loved one! 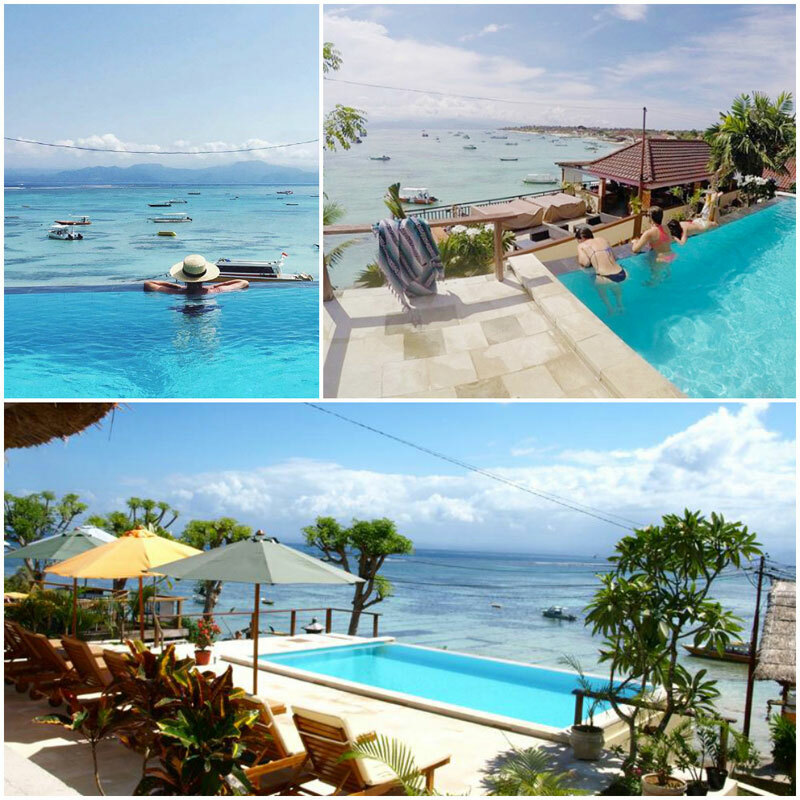 Just a 30-minute speedboat away from Sanur is Twin Islands Villas, which offers a variety of accommodation options, all with the best view of Nusa Islands’ sea. 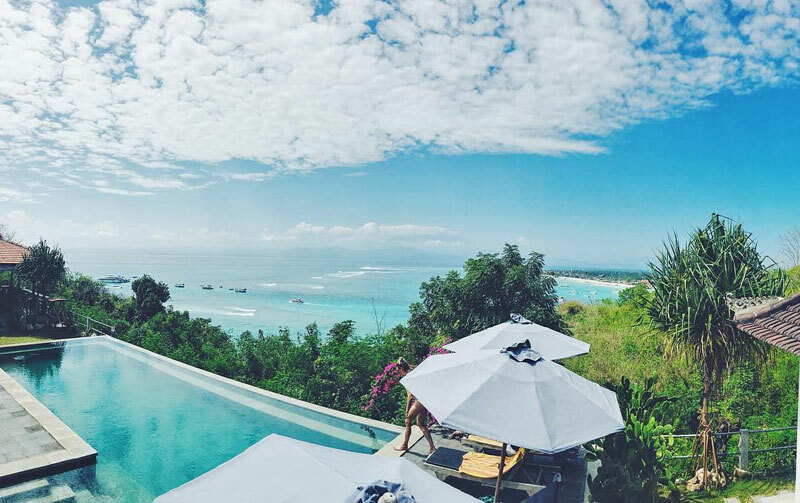 Set in the lush garden with the matching blue ocean ahead, this place brings an element of modern comfort with a natural tranquility that defines Nusa Lembongan. 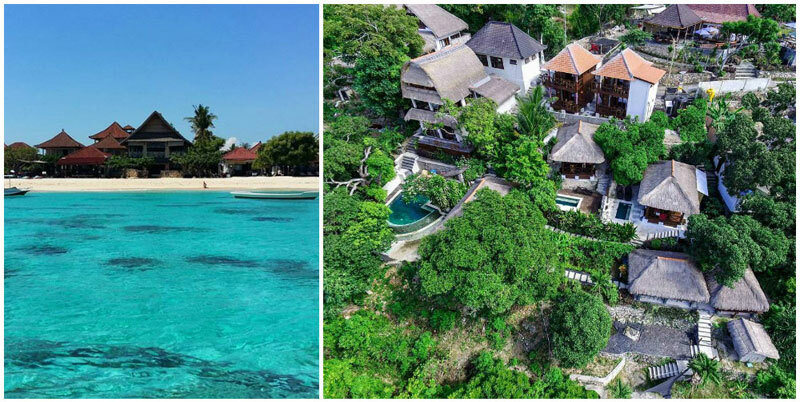 Couple may choose Villa Kecil or Villa Cinta (also known as the “Love Shack”) that is a private villa amidst the tropical garden with a scenic sea view. 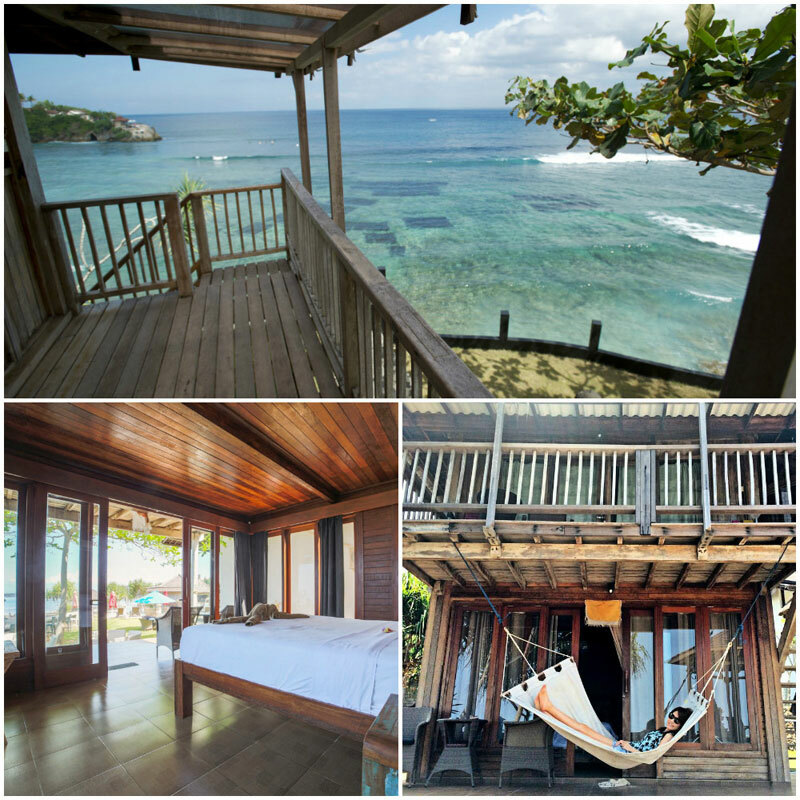 Both come with a private plunge pool and terrace balcony for the best spot to marvel at the ocean. 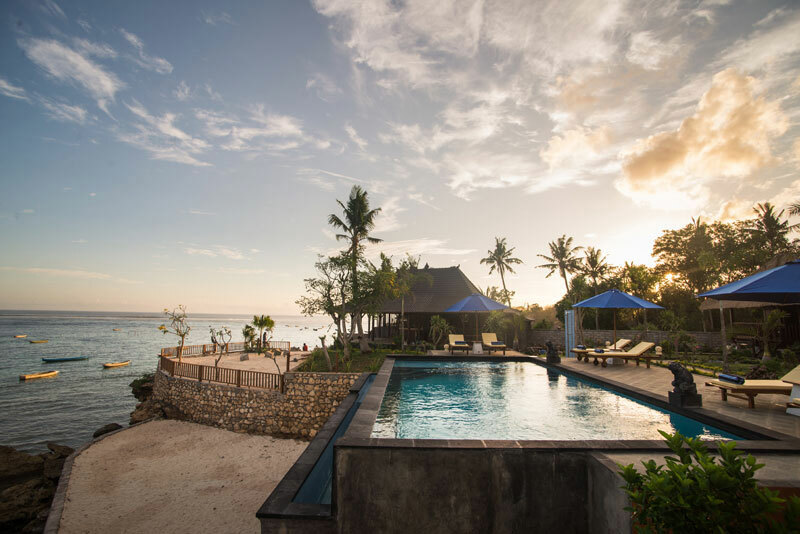 With the cool breeze in your hair and the bluest sea in front of you, Twin Islands Villas will be an out-of-this-world experience for any couple. 4. 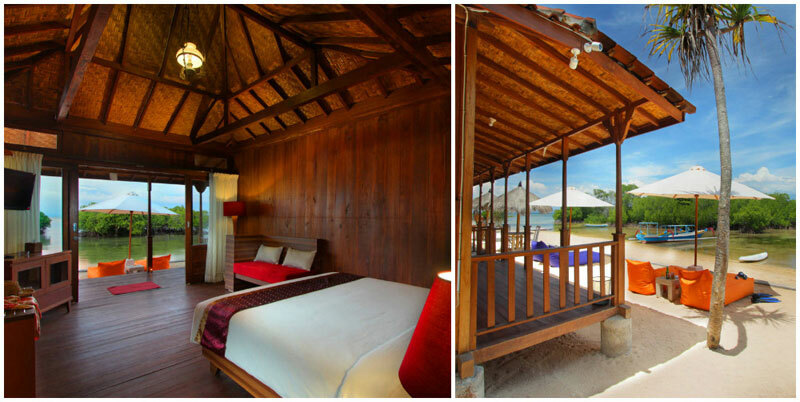 Dreamy oceanfront panorama in an exotic beach hut: Dream Beach Hut. 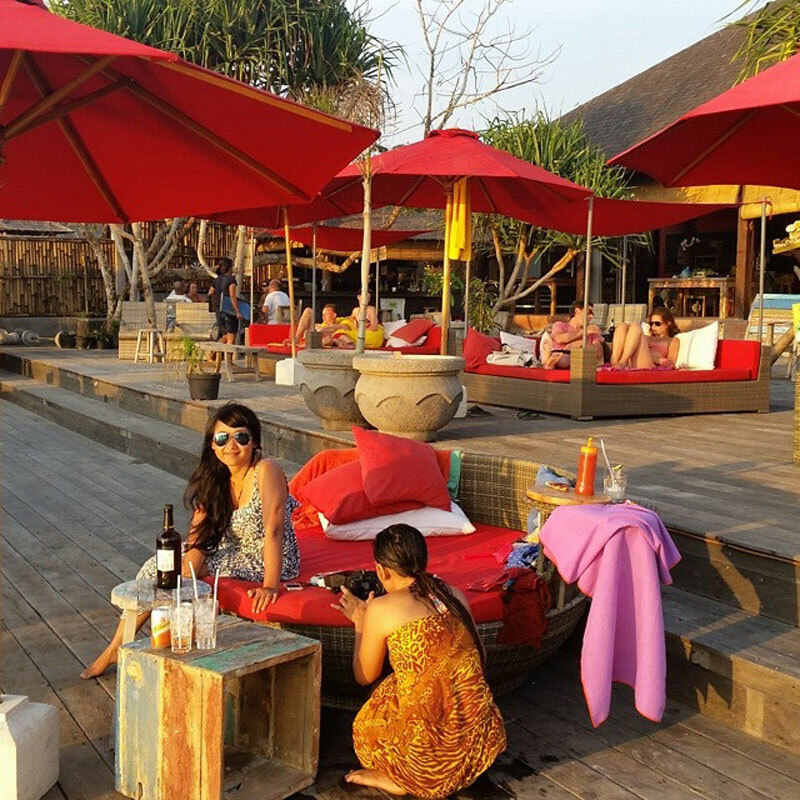 Located just on the southern coast of Nusa Lembongan, Dream Beach Hut promises a dream vacation for every couple. 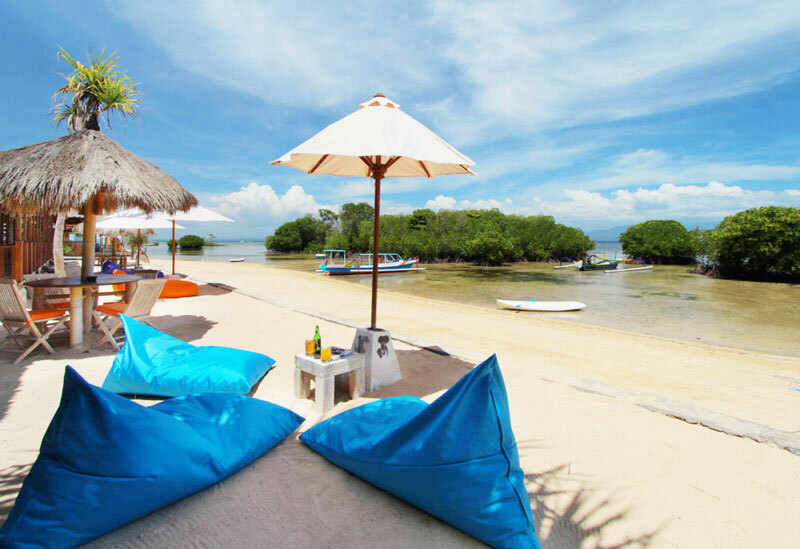 In the quiet of the day, this magical place holds the seat to a secret beach with the most relaxed beachfront and aqua blue ocean. 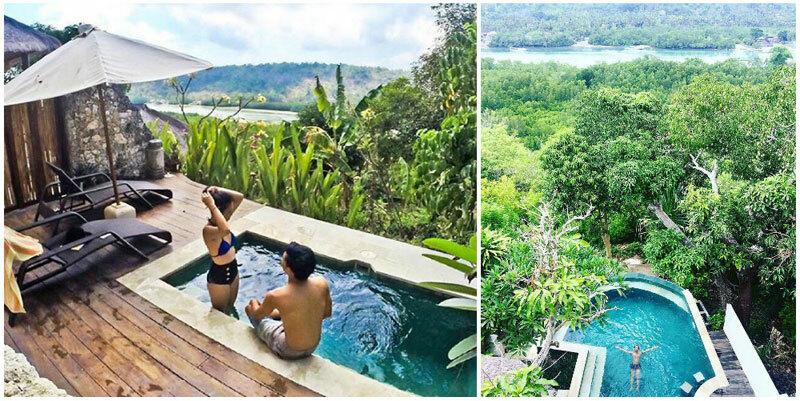 Following the concept of Lumbung-style villas (the traditional huts of Bali), each room exudes the exotic vibe that fits just right for any couple. 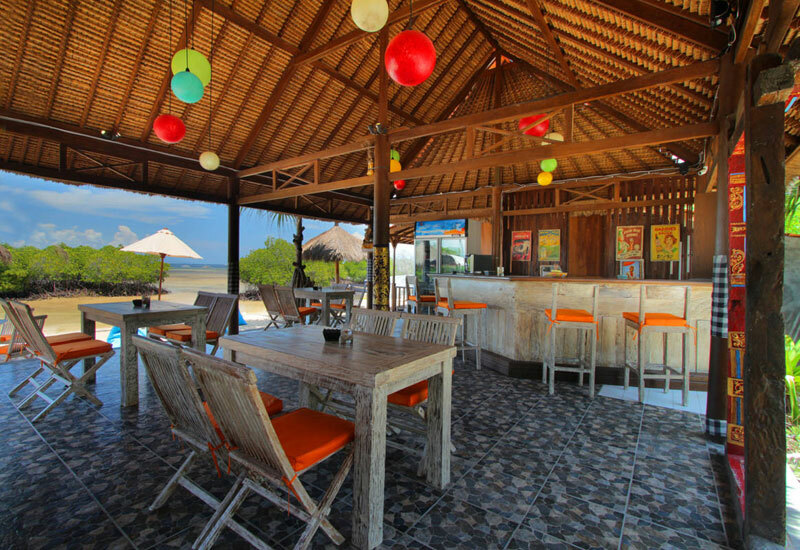 Choose from standard or deluxe ocean view to enjoy sunset from the comfort of your beach-chic huts. These standalone rooms are built to elevate romance after a day of enjoying all the best of water activities the sea has to offer. 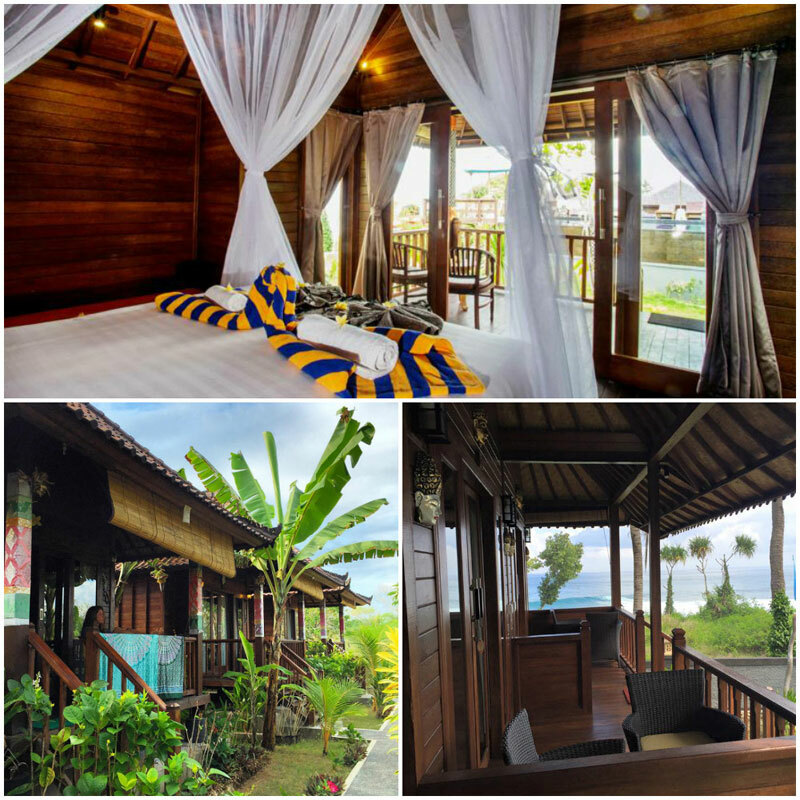 With only 5 lovely bungalows that overlooks the ocean and a private beach, Pesona Mangrove gives you the privacy you want with your loved one. 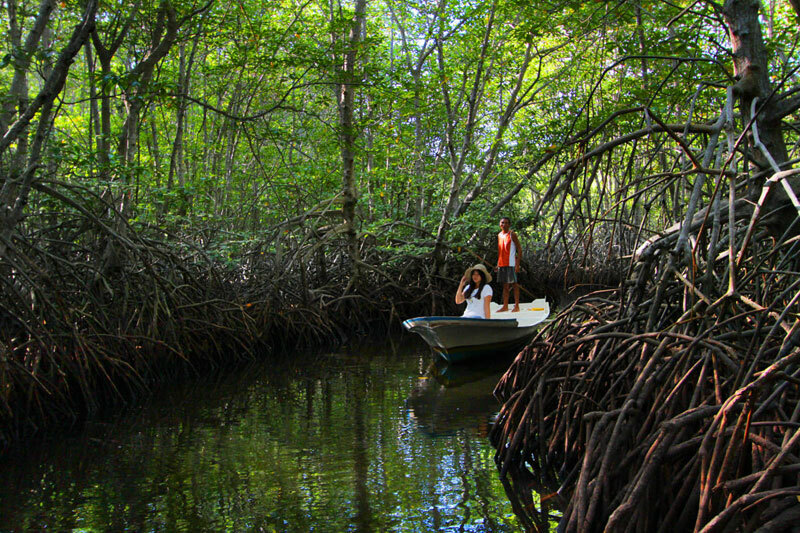 Located in Nusa Lembongan, it is also adjacent to Mangrove Point – a small mangrove forest with a narrow river as its pathway. 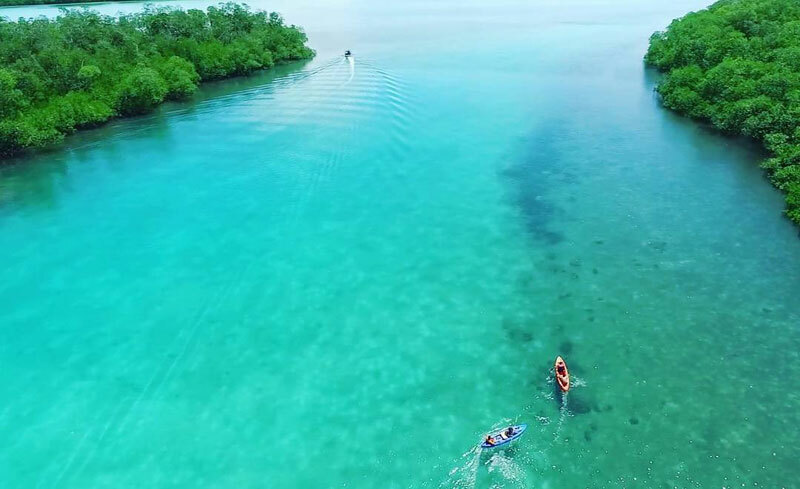 Couples who enjoy water sports will be delighted to know that there are many exciting activities here such as stand-up paddle, kayaking or surfing. 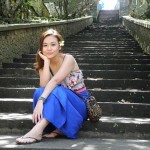 But the highlight of the hotel definitely lies in the magical setting that is filled with serenity and extra romance. Cozy up with your lover and enjoy the presence of soothing mangrove plants and the sweeping sea right in front of your terrace. 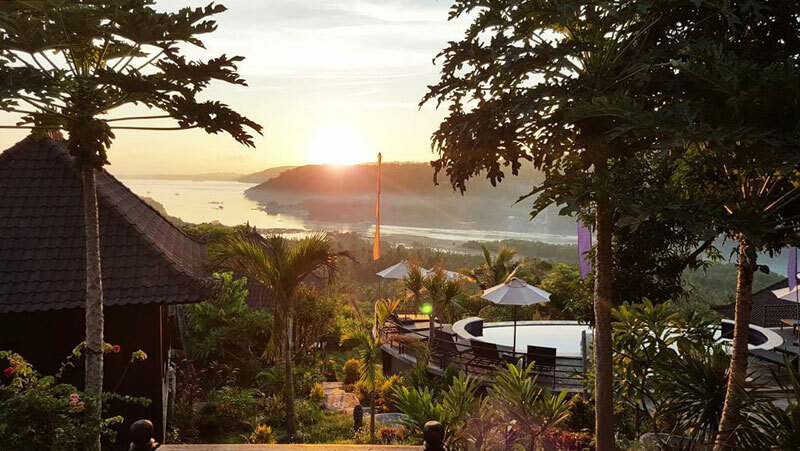 Beautifully perched on the cliffs, The Palms is often said to be one of the best hotels in Nusa Ceningan, all thanks to the combination of a magnificent view, good restaurant, pool and nice sun beds all around. 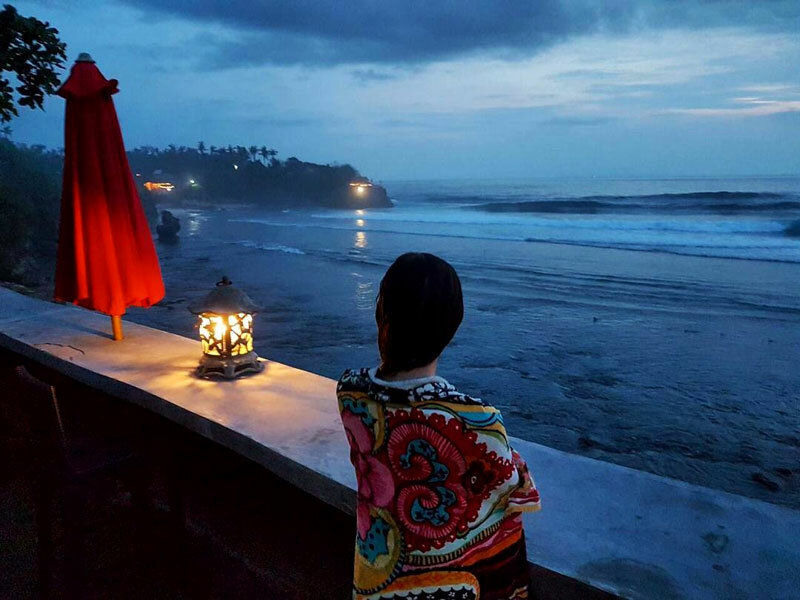 The spectacular view with rolling oceans and the sweet sunset spot will attach you to this peaceful place. 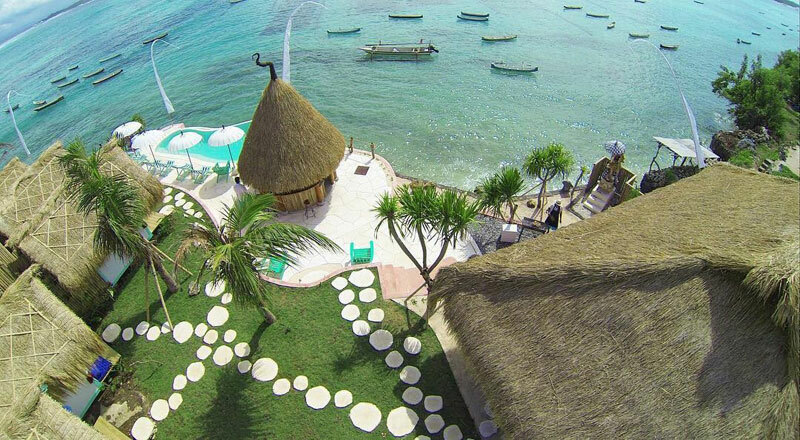 Accommodation wise, expect nothing less than spacious, ocean-facing bungalows. Furnished with complete amenities, these island-inspired rooms are designed to let you enter a calm and peaceful mode after indulging in fun water activities all day. 7. 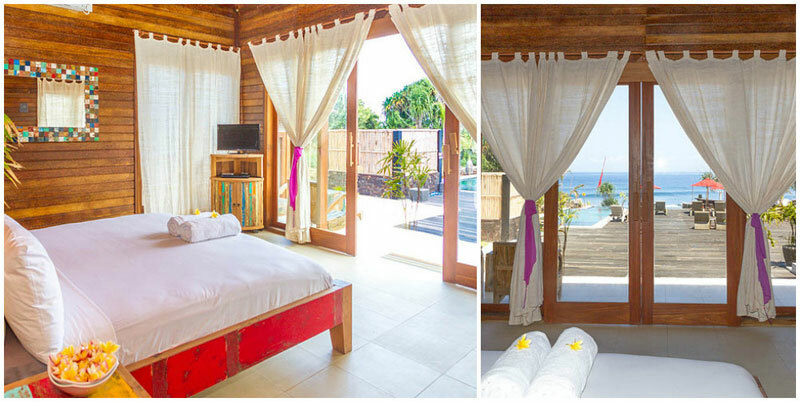 Luxurious huts with secluded and romantic ocean view: Laguna Reef Huts. 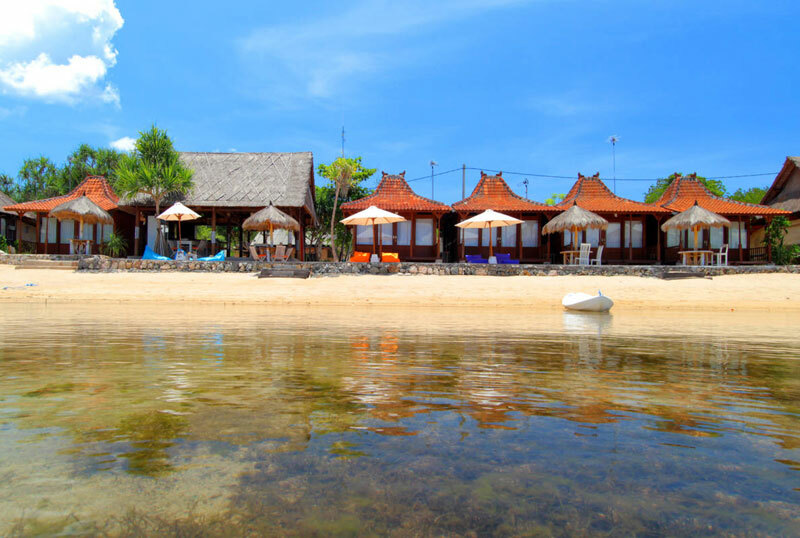 Situated at Laguna beach, Laguna Reef Huts promises an experience that’s surrounded with great views, food, facilities, and of course the winning beachfront of Nusa Lembongan. The traveling couple will enjoy this one-bedroom ocean view suite for sure. Get cozy in the king size bed and enjoy the gorgeous visual of the sweeping sea right from the terrace of your bungalow. Your sweet escape begins the moment you decide to make a romantic reservation here. 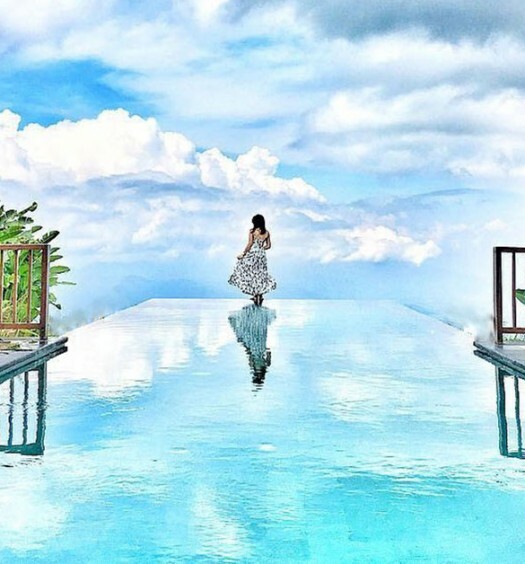 With the view of Jungutbatu Beach and Mount Agung as the backdrop, this place takes you back to the brilliance of basics with an elevated staying experience. 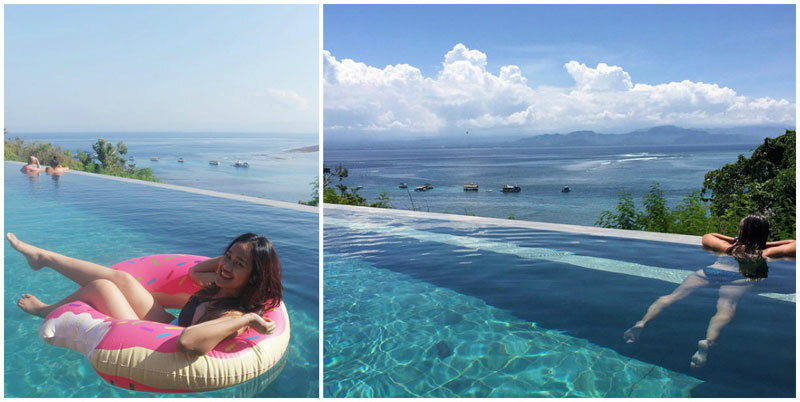 Perched on a hill, you can take in the fantastic sea view all around. 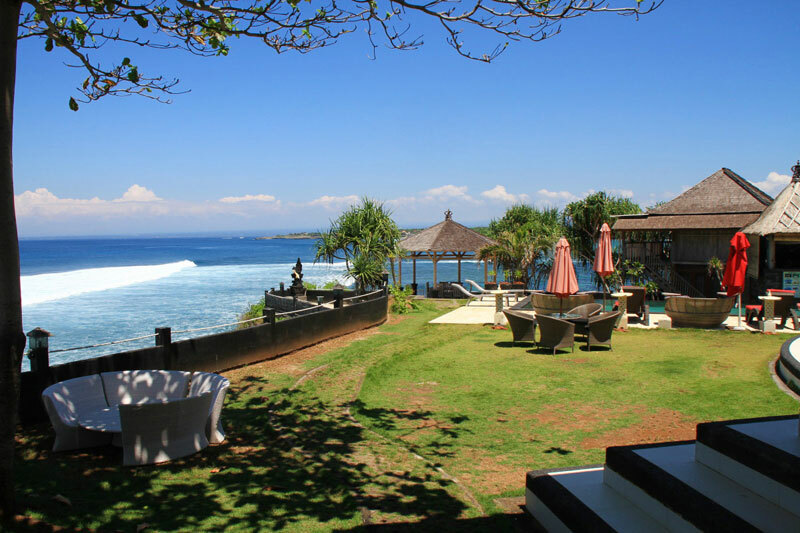 Reaching the villas requires a little bit of a climb, but while you’re at it, you’ll get an almost unreal panorama of the best combination – the sea, surf breaks, and the volcano. Spacious is also the name of the game if you choose to spend a night here. 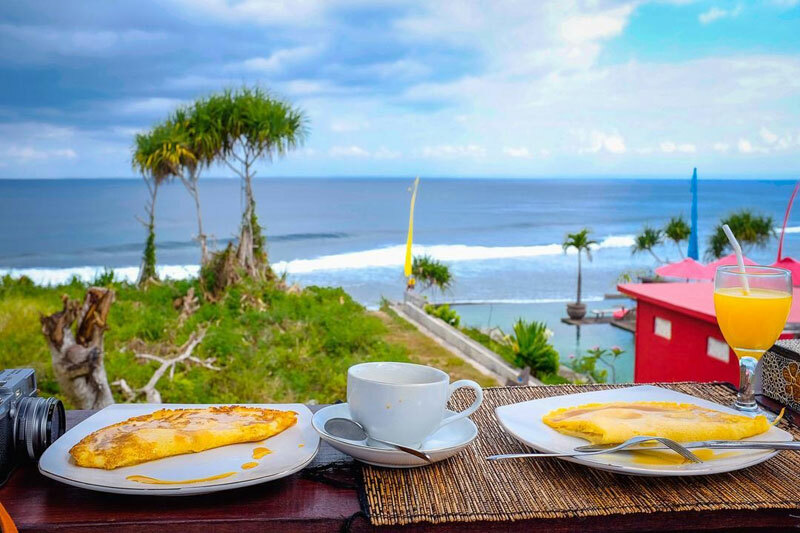 With priceless ocean view from your villa, relax and plan your day ahead because the possibilities are simply endless. 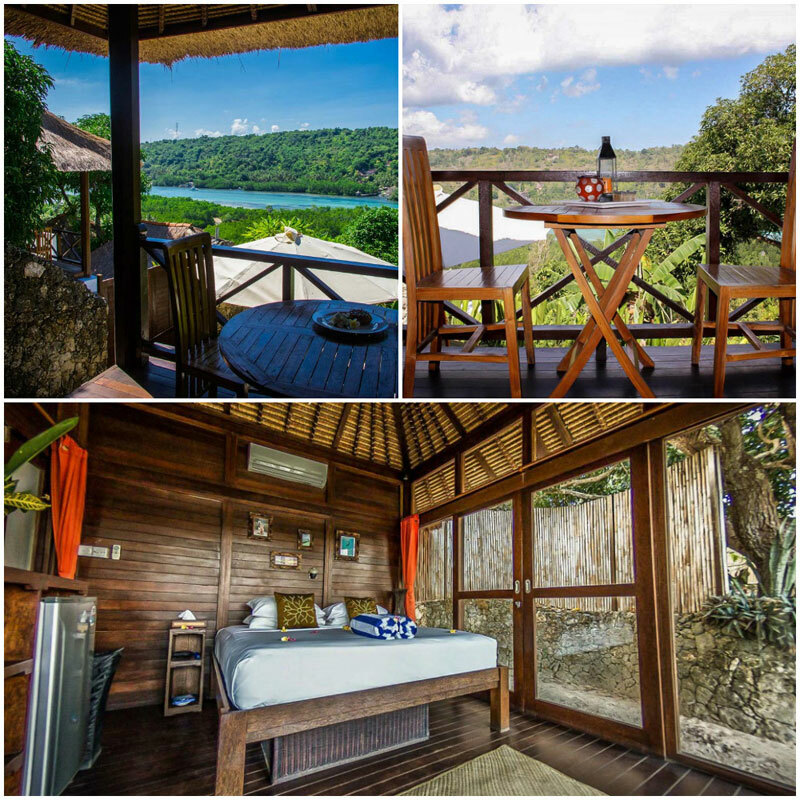 For the ultimate getaway that is far from the mainstream holiday, Sunrise Huts Lembongan is a fresh change of perspective. 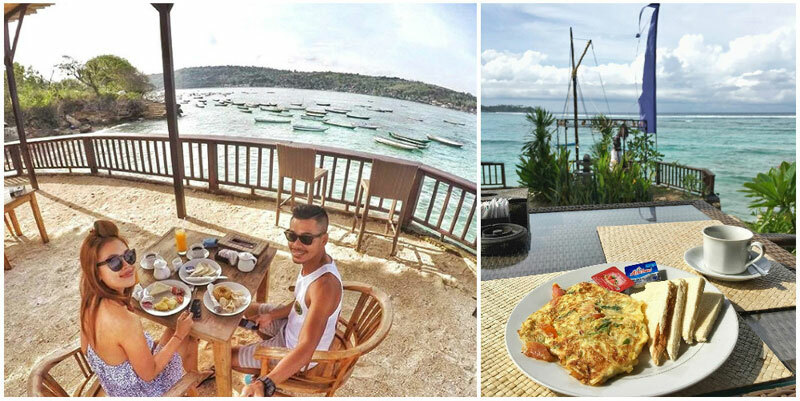 Get to this hidden slice of heaven that presents an extraordinary view of sunrise and glorious sea with gentle crashing waves. 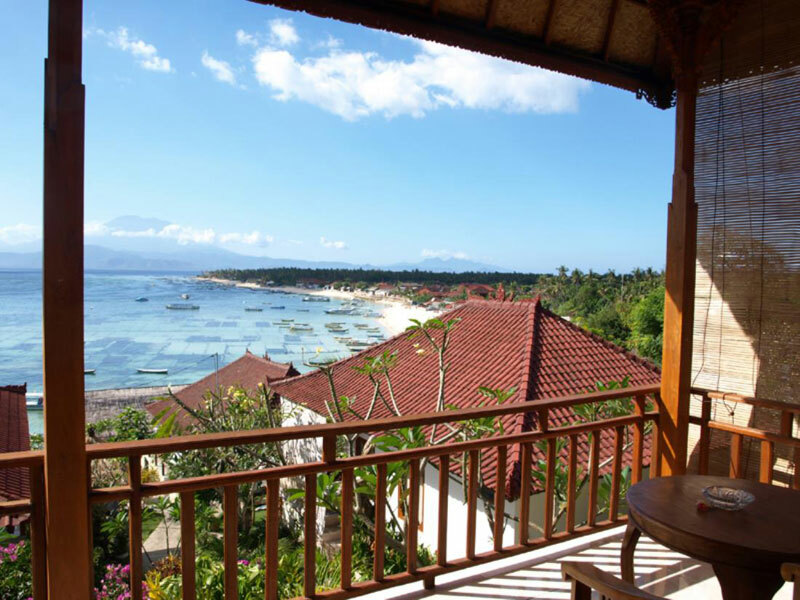 Their deluxe bungalow with sea view gives you an unabashed view of the distant mountain and sparkling blue ocean that can be enjoyed from the privacy of your terrace. You can head out using the ride facilities that the hotel provides for your activity of the day or take a stroll in this gorgeous complex for your fill of daily paradise. 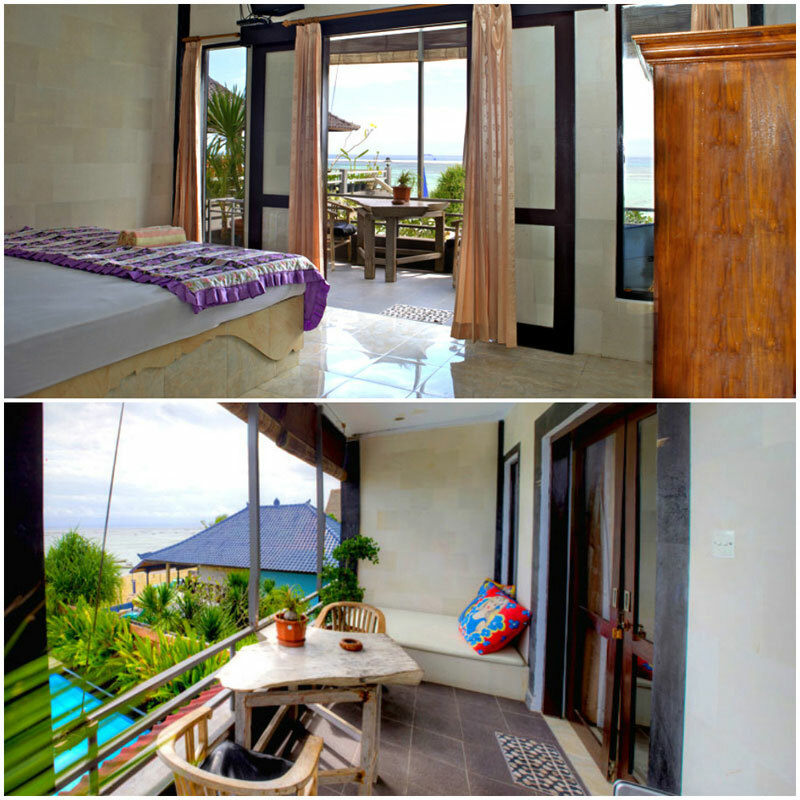 Fuss-free right from the start, Ocean Sunset Villas is perfectly located within one-minute walking distance to the Ceningan surf break. 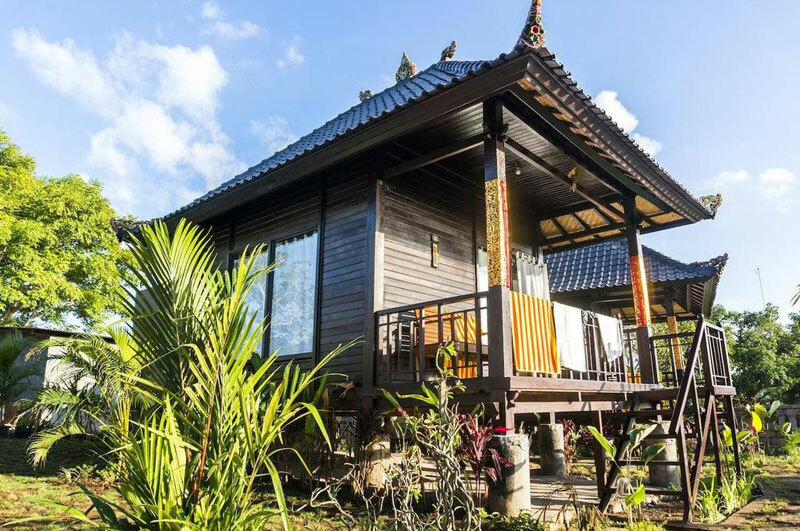 The rooms are individual wooden huts with outdoor bathrooms. 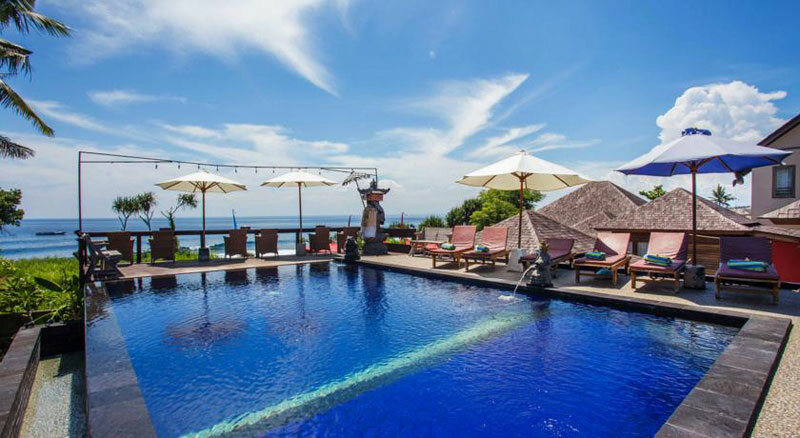 Your view will be the calming blue from the wooden deck-pool layered with another great stretch of glorious natural blue from the sky and the sea with mild rolling waves. 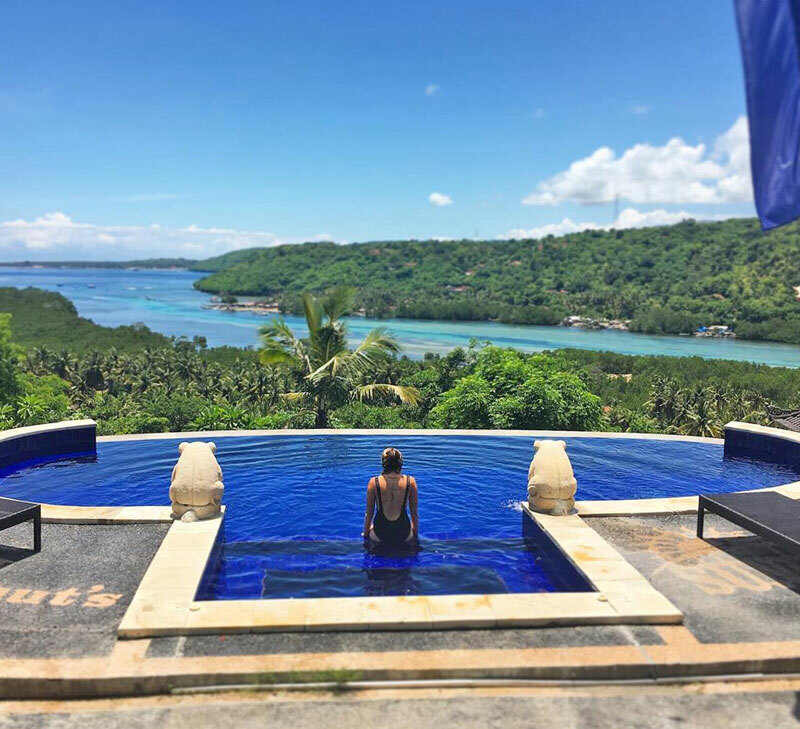 Perched on the cliff that overlooks Secret Point surf break, it takes only 5 minutes to experience Blue Lagoon and a small private white sandy beach from Jenny’s Place. 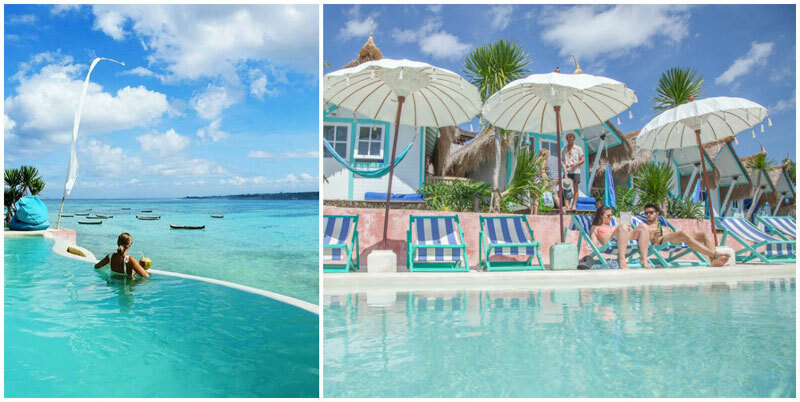 The stunning view of crystal clear waters is guaranteed to sweep anyone off their feet. And it doesn’t stop there. 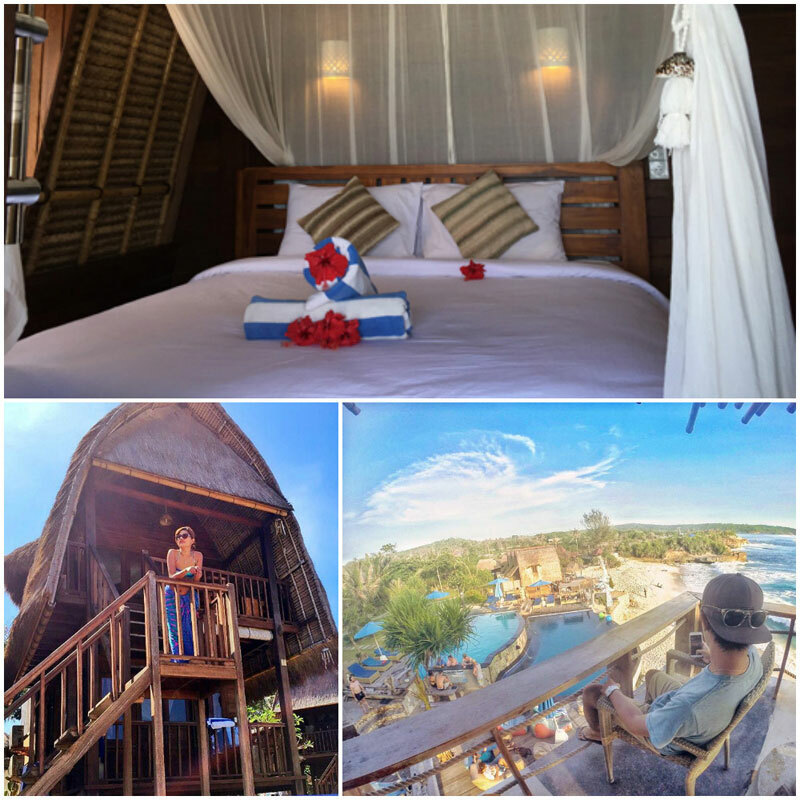 With rooms that also shares the same amazing oceanfront view, there are several types of ocean view bungalows to choose from – all of which shares the same natural wooden theme style, complete with terrace deck where you can enjoy the peaceful panorama with clear visibility. 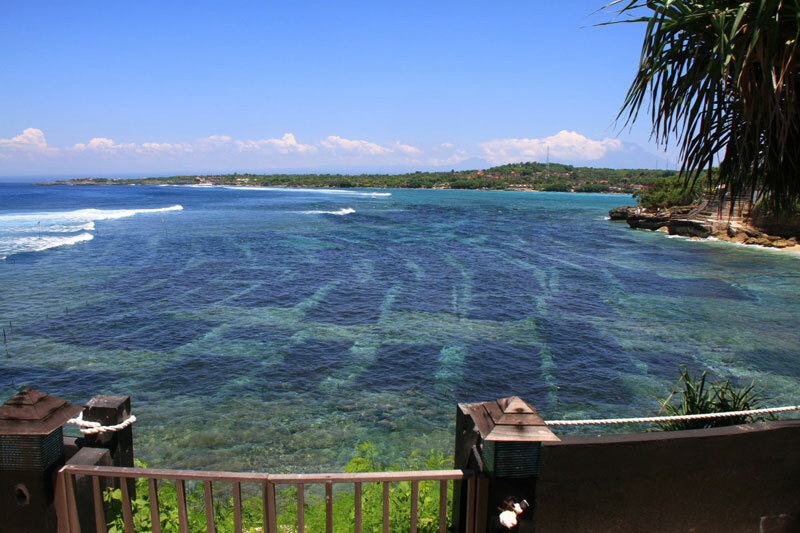 Parked right in front of Jungutbatu beach in Nusa Lembongan, Tarci Bungalows boasts an unparalleled panorama of surfing paradise and some of the clearest water you will find. 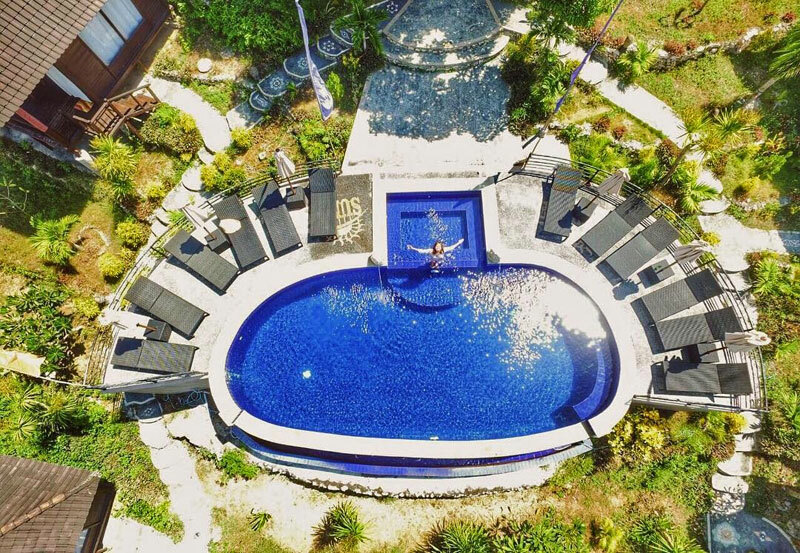 With colorful coral reefs and sandy beach, surfing, diving, snorkeling, fishing or lazy suntanning are just some of things you can do in peace here. 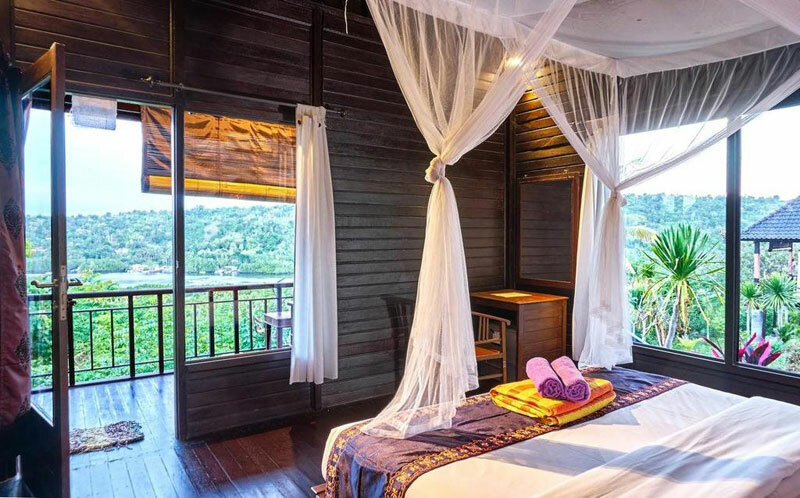 Run by a family with over 30 years of serving history, Tarci Bungalows provides 2 cozy deluxe ocean view rooms that easily fit the traveling couple. Clean and simple, this beautiful room is just the right kind of place to stay when you’re looking for price for value, superb view, and the most strategic location. 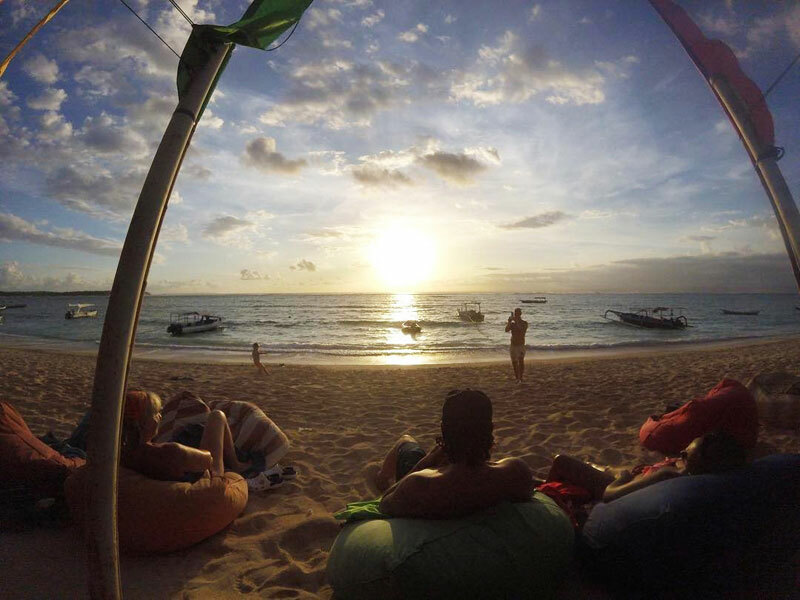 Watch the sunset from the deck of your room or take a nice and easy stroll along the beach. 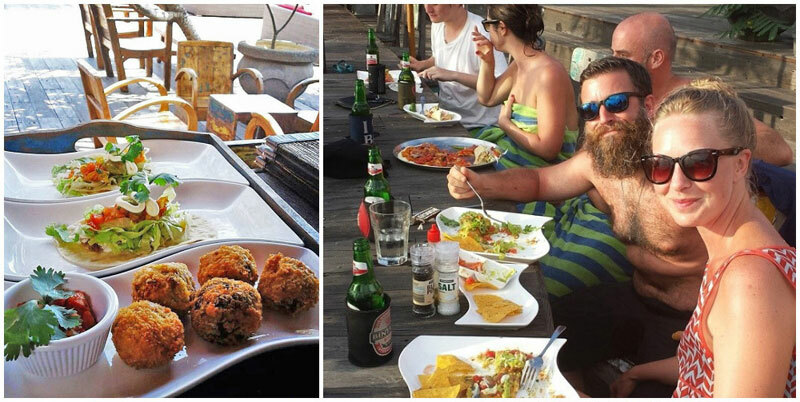 The friendly staff will welcome you back with comforting meals in the restaurant, that is situated just next to the ocean view rooms. 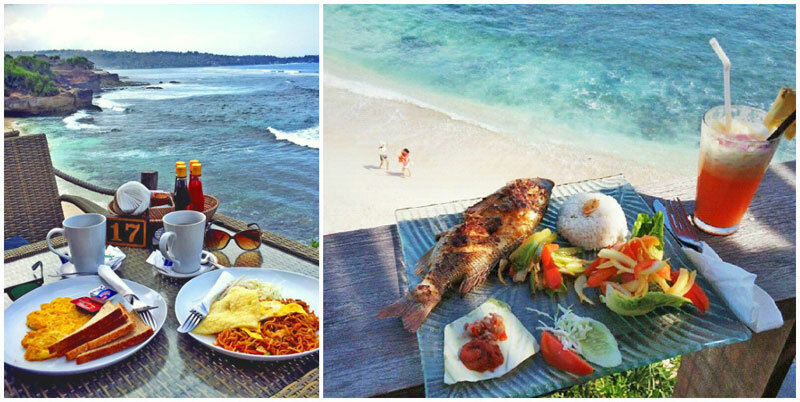 With these mind-blowingly affordable selections, gone is the assumption that accommodation on the Nusa islands are expensive. 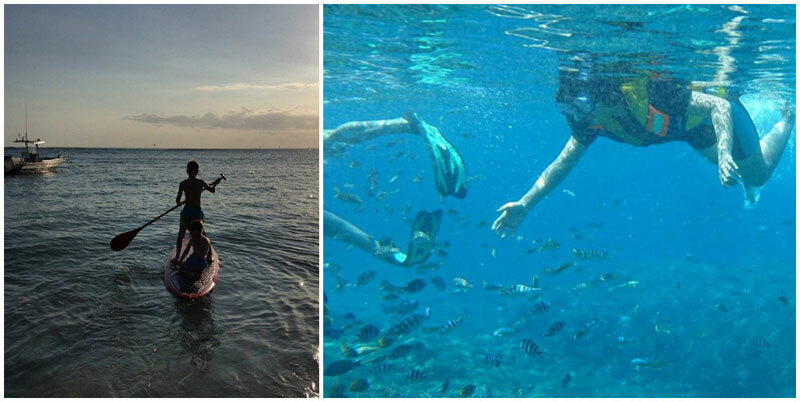 Let’s head off to the Maldives of Bali and enjoy the best watersports without a single worry about prices! 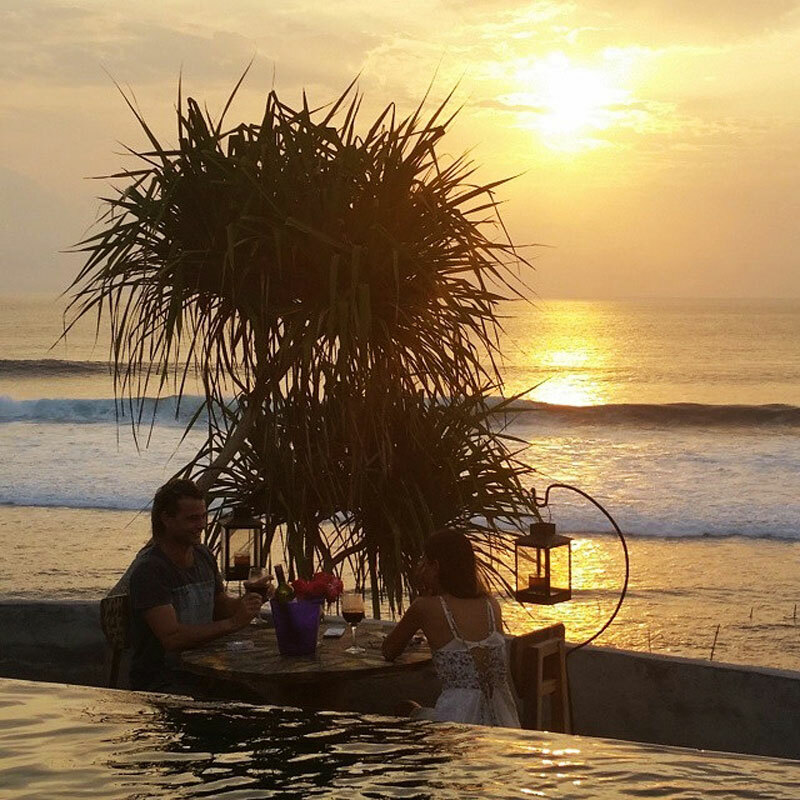 Are there any more affordable oceanfront villas on the Nusa islands we missed? Share with us today!